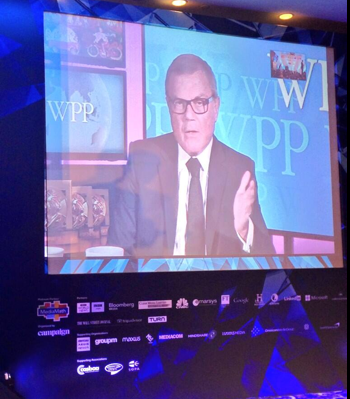 The day began with a high-energy exchange between WPP chief executive Sir Martin Sorrell (via video from New York) and CNN anchor Richard Quest. Sorrell was cautiously optimistic-a step up from last year’s mood. He said he expected more GDP growth, but noted that clients are still extremely cautious. "The way that people are making up the numbers is not with topline growth its by cutting costs," he said. To Quest’s suggestion that media agencies might be losing their relevance, Sorrell asserted that they are more relevant than ever. He went as far as to say he believes in many respects the medium is more important than the message. A two-part session around the theme of "Goliaths" followed. First up, Jerry Buhlmann, chief executive of Dentsu Aegis Network, focused on the drivers behind recent industry consolidation. In his view the push and pull of globalization and convergence is the main culprit. And the gravitational force at the centre of that, he explained, is digital. Growth projections for mature markets as well as traditional media hover around 3 per cent at best. But when you look at forecasts for social, mobile and video you see growth numbers that surpass 50 per cent. He argues companies and agencies have no choice but to bulk up on digital skills and assets. "That's where the growth is going to come from," he said. In the Q and A session that followed, Ruth Rowan, CMO AMEA at BT Global Services, and Seraphina Wong, executive director of global advertising at UBS, joined Buhlmann on stage to talk about how the recent Omnicom/Publicis and Dentsu/Aegis mergers have affected their business from a client perspective. They agreed scale is an important factor for selecting an agency and the need to be global, both in terms of business and expertise. Buhlmann added that bringing these already big businesses together won't be easy but if internally there is alignment on vision and values the process can be relatively smooth. Post-consolidation he also predicted the industry would be more real-time oriented, have greater reliance on programmatic buying technologies and see more power shift to Asia. Collaborative content has become a buzz phrase in the last year, and a panel on the topic featured Dean Dacko, SVP marketing, Malaysia Airlines; Chris Davies, director of sales and marketing, BBC Global News; Hari Krishnan, MD Asia-Pacific and Japan, LinkedIn; Jayant Murty, director of strategy, media and integrated marketing, Intel; and Adam Najberg, digital editor for Asia at the Wall Street Journal. A key takeaway was that brands can no longer create content in isolation. Swamped by information in today's digital marketplace, consumers are increasingly retracting from the deluge of data at their fingertips and instead gravitating to a few key, trusted sources for information and dialogue, whether these be online news portals like the BBC, professional portals like LinkedIn or social networks like Twitter. Getting in the stream of quality, trusted content, then amplifying this via social networks, is the key to effective communication. This collaboration is manifesting in various initiatives which, at their centre, focus on entering, participating in, and generating conversations with consumers. Bloomberg Media chairman Andy Lack then took the stage along with Michael Kassan, chairman and CEO of MediaLink as interviewer. 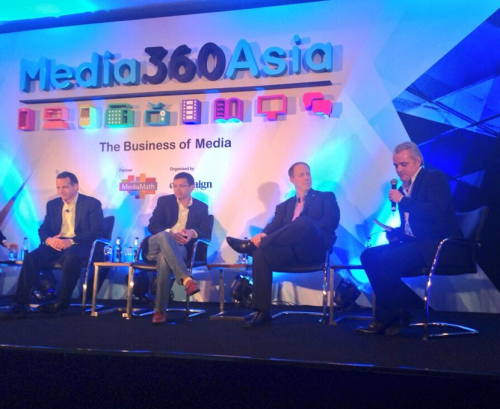 Among the topics discussed was so-called 'native advertising'. Lack said there must always be a clear distinction between advertising and editorial content. "At the same time, [audiences] know there are times when that line will be close," Lack said. "That's not a threat to editorial content unless you blur that line…you've got to fight to hold that line clean. Right now it is wobbly and that is a concern. But when consumers get burned enough times they'll stop going somewhere where the line is blurry." A panel entitled "Mad Men versus Math Men" yielded neither anger nor (thankfully) a deep dive into mathematics, but rather widespread agreement that the victors in the future will be the smart men (and women) capable of combining creativity and technology to the greatest effect. "What maths or analytics does is powers the creativity, making it that much more effective through targeting that gets the right message to the right people at the right time and then validating that it delivers results," said Rahul Welde, vice president of media for Unilever Asia, Africa, Middle East, Turkey and Russia. Even the panelist whose company has "math" in the name, MediaMath co-founder Greg Williams, sounded a tone of bonhomie while arguing that automation of all media buying is essential for efficiency. "Strategy and business decisions on top of that automation is what will be key to brand marketers and the agencies that are working with them," he said, adding that up until now, tools have not been sufficient to allow marketers to focus on the more crucial higher-level tasks. John Sheehy, president of global operations for Starcom MediaVest Group spoke for the agreeable group when he said, "Data allows brands to be there when we want them to be there with things that are really engaging for us." In Dominic Proctor's discussion with Campaign Asia-Pacific managing editor Jason Wincuinas, the GroupM president made it clear the biggest challenges he saw for media networks in the Asia-Pacific in the foreseeable future were sourcing and training talent, and sustaining big enough profit margins to keep up with the pace of change. He said cultivating a sophisticated talent pool in the developing region will be a priority for GroupM in the coming years, with much investment in training. He also emphasised clients' extreme caution — once considered a layover from the GFC, and now a characteristic of the industry at large — as having improved the media business. The pressure to continually justify what agencies do has made the business far more professional and respectable, he said, with agencies now forced to continually prove their worth. The challenge now is to focus on adding services and products, to continually reinvent themselves to ensure they creep up the value chain and avoid becoming transactional suppliers. The fear of a race to the bottom is ever present, so agencies must work harder than ever to keep momentum, keep fuel in the tank, in order to keep growing and evolving. A panel moderated by Greg Paull, principal of R3, addressed the topic of unrelenting pitching in Asia and how to make a pitch worthwhile for both parties. Paull noted that last year there were in excess of 4,000 pitches in Asia-Pacific, amounting to around US$7 billion in billings. The pace shows little sign of abating and procurement officers are more in demand than ever. Jonathan Rudd, associate director, marketing agencies procurement Asia Pacific, Johnson & Johnson, prides his work on focusing on analytics and taking the marketing team through the value of that. "Marketers aren't necessarily ready to evaluate the success level of a agency partnership structure without the role of procurement, so we have a supply management programme in place to make sure of continued benefits for both," Rudd said. Media agencies are to blame for the commoditisation of media, said Philips' senior director and global head of media Sital Banerjee during the panel discussion on the subject moderated by George Patten, MD of Accenture Interactive. "While I agree that clients have played a role over the years by asking for more for less, the agencies keep delivering it." Steve King, worldwide CEO of ZenithOptimedia however stood up for his fellow media specialists and insisted that media became commoditised because there was just so much of it in the 90s — a phenomenon that would have taken place whether or not media agencies came into existence. But the situation is changing thanks to the ability to target audiences and buy media based on data. "This is the opportunity, media people this is your stage and the spotlight is on you," fellow panelist Henry Tan, COO of Astro, challenged the audience. "If you don't add value and make a show and dance of it, the spotlight will move on." In a dynamic presentation around the "Hackonomy", Bonin Bough, VP of global media and consumer engagement at Mondelez, said studies show the mobile phone is as addictive as cocaine, which puts it on a level way past TV in terms of technological relationships. So why then, he asked, is the industry still spending so much money on a medium that consumers only spend a few hours with every morning and evening. Mobile devices, he argued, are in your pocket all hours of the day. And in particular they are with consumers during that crucial journey to purchase. For years brands have had to surrender a direct link with consumers to retailers. "We drop off our products at the store, and wish them luck — go sell yourselves," he said, making a motion as if shepherding small children to run along. Now with mobile and social technologies, brands have a chance to get into the conversation and become a part of that journey. Bough emphasised this is so important because such a large portion of purchases inside a store are impulse buys. Recognising that and decoding (or hacking) the behaviours that lead up to the buy is what can give marketers a road map to engaging consumers and advertising's future. It's not about sitting on the couch anymore. "Get excited about change,"he exclaimed, instead of clinging to tradition. In a late afternoon session, three agency executives, Gerry Boyle, Asia-Pacific chairman of ZenithOptimedia; Cheuk Chiang, Asia-Pacific CEO of Omnicom Media Group and Mark Patterson, APAC CEO of GroupM, appeared to answer for all the sins of all media agencies in the 'race to the bottom' that came up so often earlier in the day. Or at least that's how it seemed given the line of questioning. While none of the panelists proved eager to share specifics with their competitors sitting right next to them, they broadly agreed that while focus on price is not going away, it behooves them to move the conversation beyond it. "The temptation is always there to chase billings and chase new business and chase momentum," Patterson said, adding hopefully that in the next few years more different types of conversation will take place between agencies and clients, and you will see agencies saying no. Chiang commented that value is benefit minus price, and mentioned automation and innovation as factors that are improving the benefit side of that equation. Boyle hung his hat on strategy as an oft-forgotten element of emphasis. "Without great strategy, you have nothing because that is what gives you permission to execute on behalf of the client." The day ended with a dissection of the modern media business, moderated by Angela Mackay, Asia-Pacific publisher of the Financial Times. With recessionary pressures once again on the rise, the demand for maximum ROI is evolving media businesses into more sustainable models. Agency bosses, such as Mike Cooper, CEO of PHD, viewed technology and data-focused organisations as long-term partners instead of threats. That pleased Karim Temsamani, president of Asia-Pacific at Google, who said the ability to use technology to provide content to users on different types of platforms is showing tremendous potential for media. "The reality is we still have an enormous discrepancy between the time people spend on mobile devices and the media investment from clients who haven't yet embraced a real need to engage." Until that happens, sustainability is still stalled. Cooper also emphasised how the media business is a talent-oriented business, and it is an important argument for the industry to focus on the nurturing of talent instead of purely technology and data.